A list of all the beautiful things to do and see in Italy’s capital. 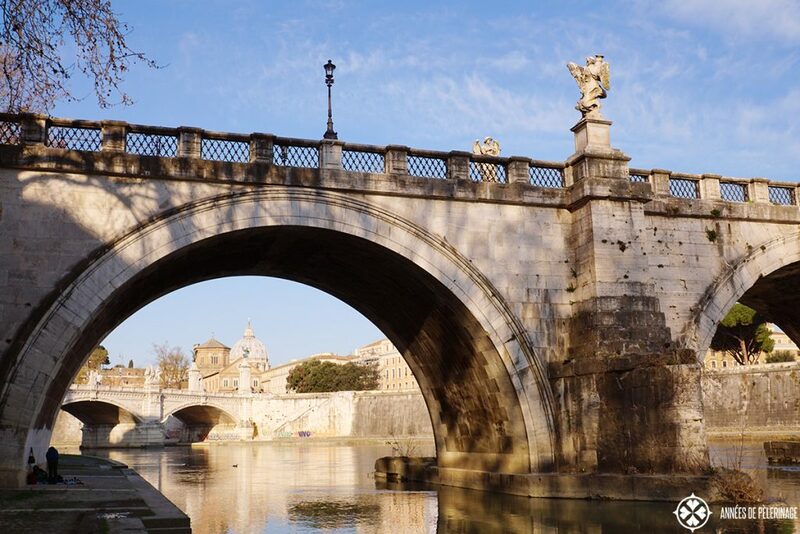 Plan your perfect stay in Rome! 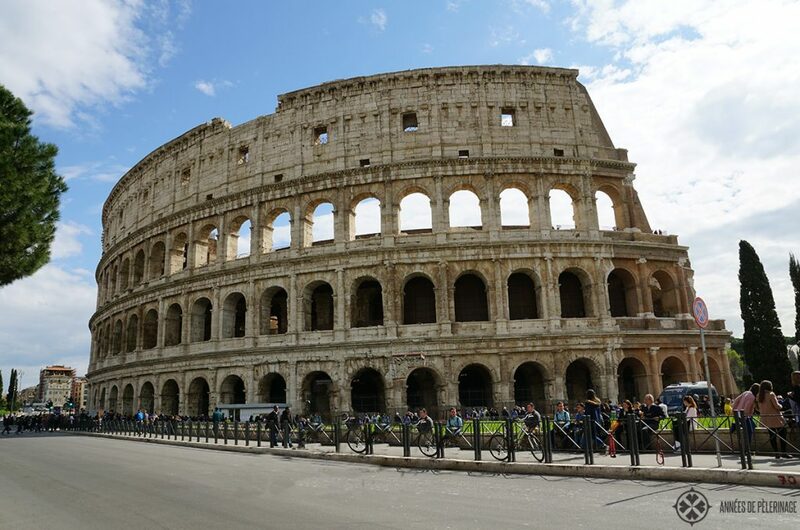 You have not been in Rome if you have not seen the Colosseum. It is almost impossible to believe that this gigantic structure survived almost 2,000 years. But don’t just stare at it, do go inside. Is it worth it? Absolutely! I always feel a bit like a gladiator when looking up at those tiered seats and galleries reaching for the sky. Ever since they tightened the security in March 2016, the queues got even longer. To save you the waiting time in front of the ticket booth, buy your tickets online. Also, consider booking a guided tour (gets you in waay faster). Otherwise, prepare yourself for standing in line at least an hour or two. Also, know that it is possible to visit the catacombs below. Access is strictly limited to special guided tours (usually in the range of 150€ per person). 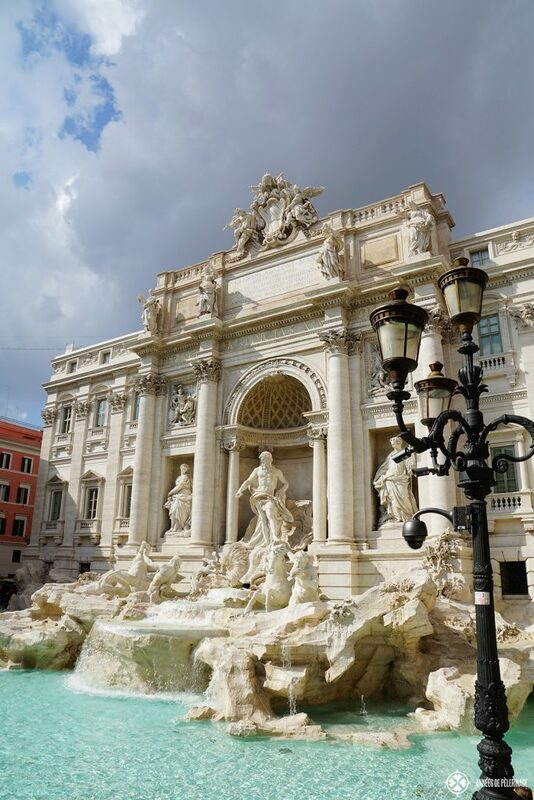 The Trevi Fountain, or Fontana di Trevi as it is called in Italian, is probably the most famous fountain in the world. Standing right in the very heart of Rome, it is always packed with tourists. 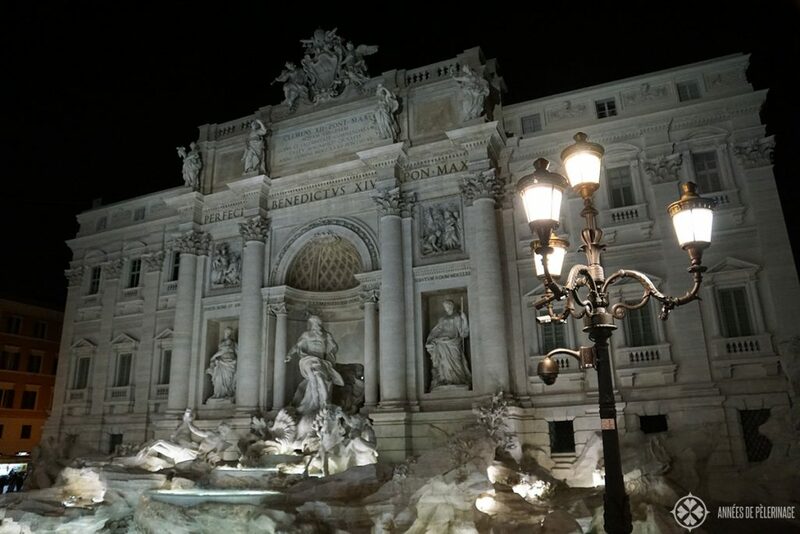 Despite those masses, it is still one of the most beautiful spots in Rome (especially at night). Legend has it, that the first coin you throw in from your right hand over the left shoulder will guarantee a return to Rome. The second coin you throw into the gargling water in this manner will bring you a new romance, and the third ensures a marriage. So ladies, count your coins! 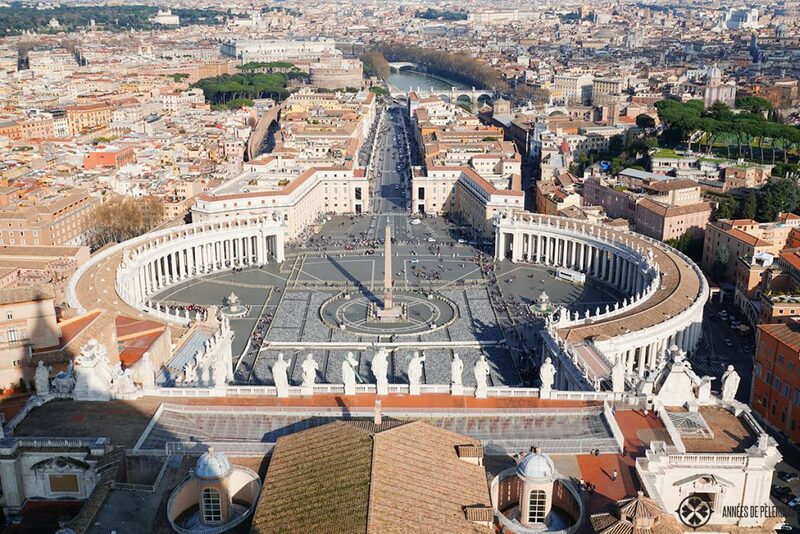 The Vatican is a supreme state within the city limits of Rome. 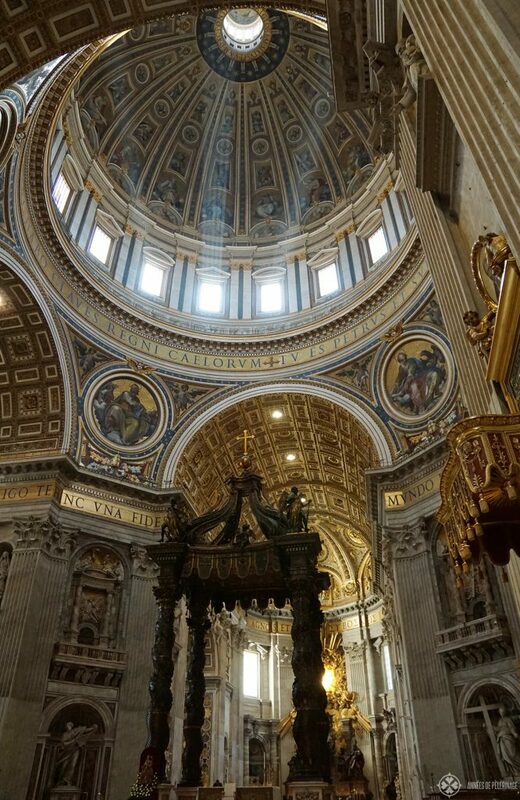 This is where the pope sits on his holy chair, this is where St. Peters is buried, and this where the largest church in the world stands. Above all, it is a wonderful place to visit. 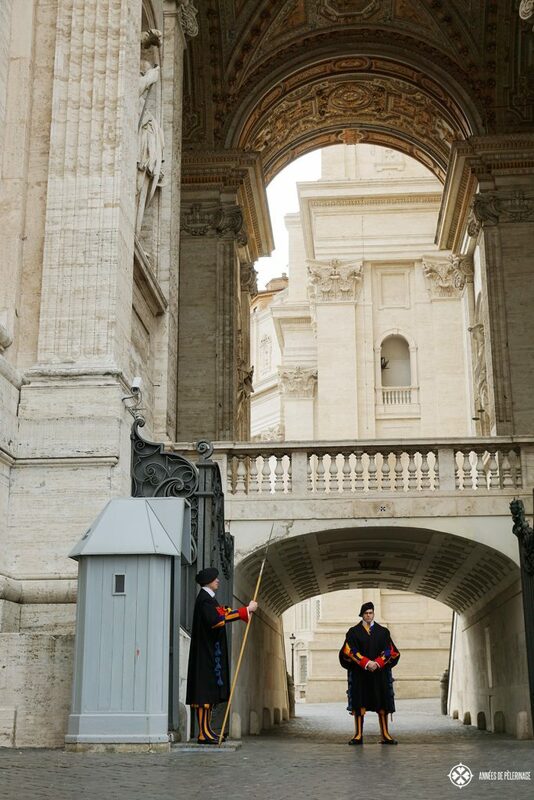 Actually, there is so much to do inside the Vatican that it would deserve its own list. For the sake of brevity, I’ll include the most important sights here. My personal highlight would be enjoying the fantastic view from atop St. Peter. Tickets are 5 Euros and will give you permission to climb the 550 stairs. The space at the very top of the dome is very limited, but as long as you are not very claustrophobic it is well worth the time. The best time to visit for taking photographs is in the late evening when the sun stands directly behind the dome. Naturally, you should not only get on top of St. Peter’s Basilica but also within. The entrance is free, but you will have to pass security. Early in the morning and very late in the evening usually is no problem. Weekdays are better than weekends. 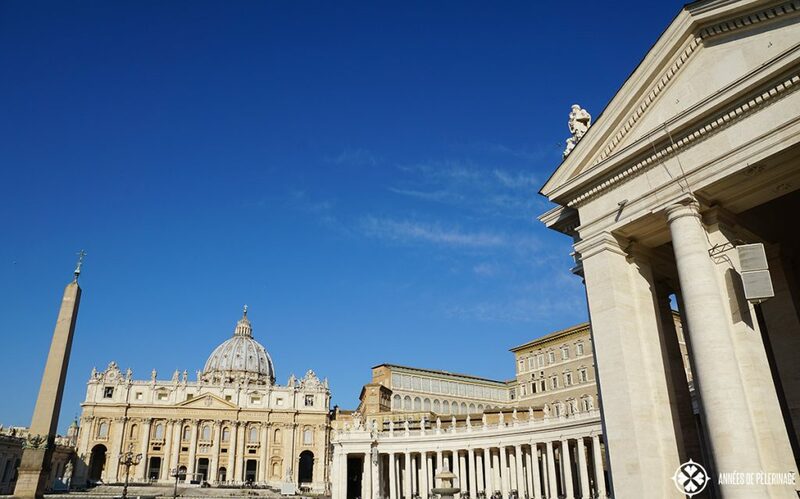 Holidays are always packed while it is not possible to get inside on Wednesday mornings due to the papal audience on the square in front of St. Peter’s Basilica (official information how to register is here ). After (or before) you visited St. Peter’s Basilica, you absolutely have to visit the Vatican Museum. It is highly recommended to buy your tickets in advance online (here is the official link). The museum houses one of the most spectacular collections in the world, so do prepare for one gigantic crowd. 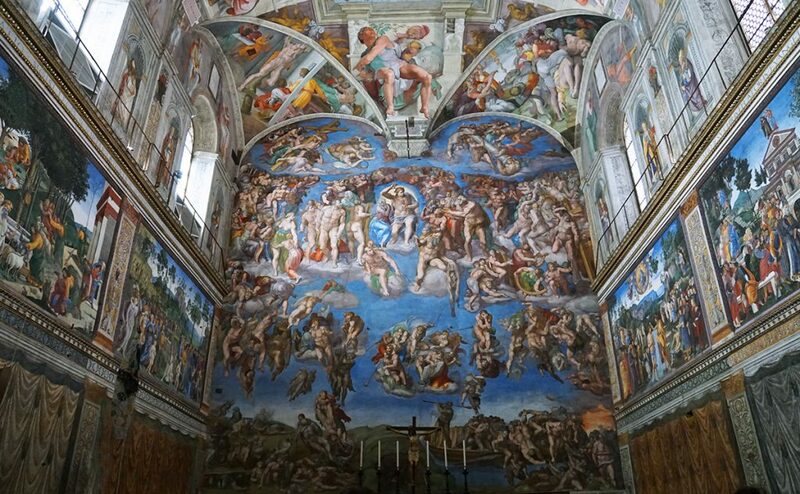 The tickets for the Vatican Museum will also gain you entrance to the Sistine Chapel. This is one of the most astonishing placed in the world. Frescos from Michelangelo, Botticelli, Perugino and other famous painters adorn every inch of the otherwise quite simple chapel. 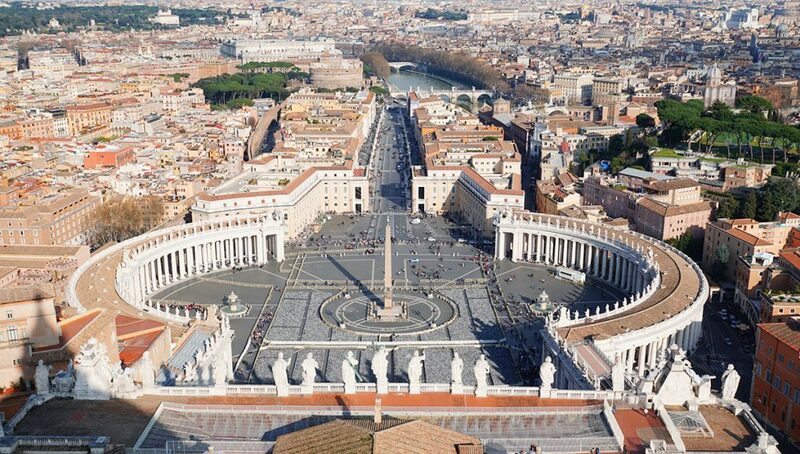 Here is where the popes are traditionally elected and some might even call it the very heart of Christianity. 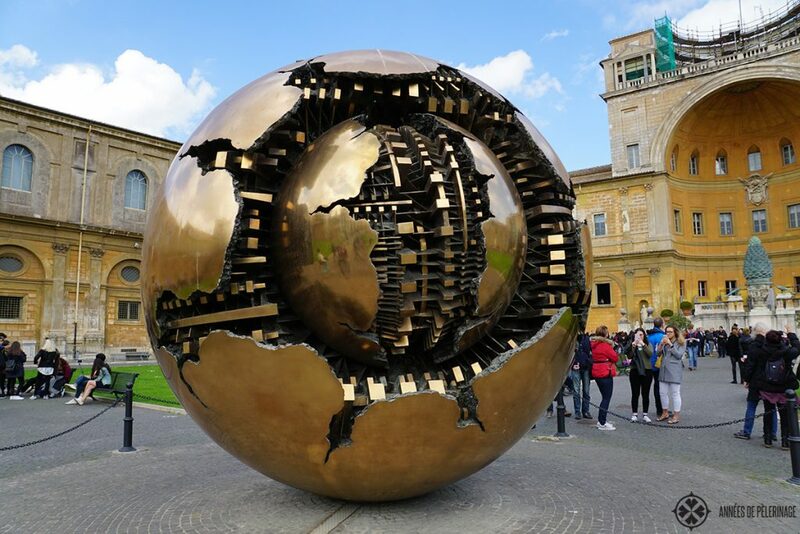 Plan at least half a day to see Vatican museum and Sistine Chapel – more if you like to see the Pinacoteca and the gardens. Not far from the Vatican, but equally as enchanting, lies the Castello Del Angelo. Named for the angels standing on its roof, it has once been the mausoleum of the ancient Roman Emperor Hadrian. There is quite a lovely museum inside, but above, all it gives you the unique chance to look on St. Peters Basilica from above. (It is also an infamous spot for girls taking pictures on the cobblestones in front of it). 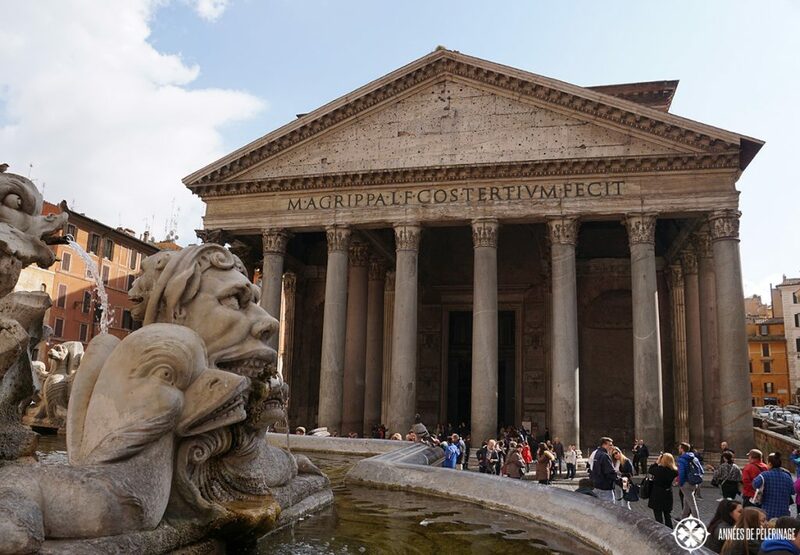 The Pantheon is an almost 2,000-year-old temple that has been transformed into a church during the medieval times. Despite this vast history, it is still the world’s largest unreinforced concrete dome. Step inside and be amazed by the architectonic ingenuity! 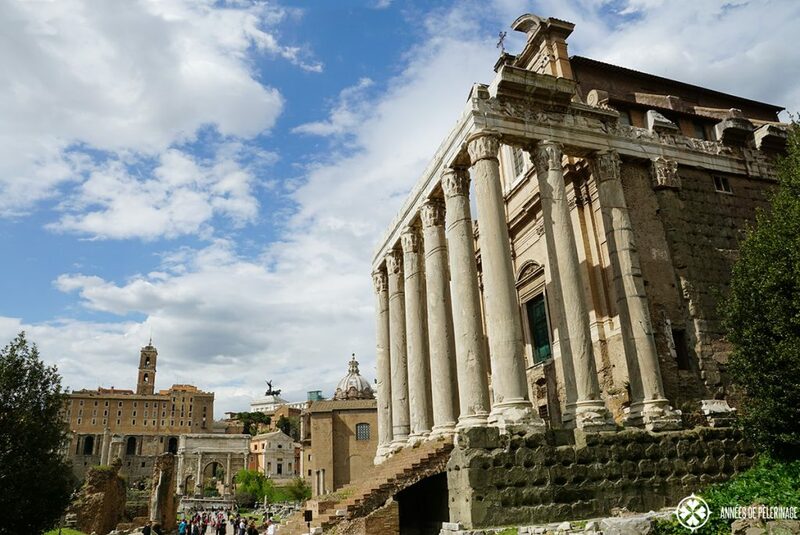 The very heart of ancient Rome has once been the Roman Forum. Throughout the Roman Empire, this glorified marketplace was the center of all public life and more or less the known world. Not much of it remains, but that which remains is no less impressive. 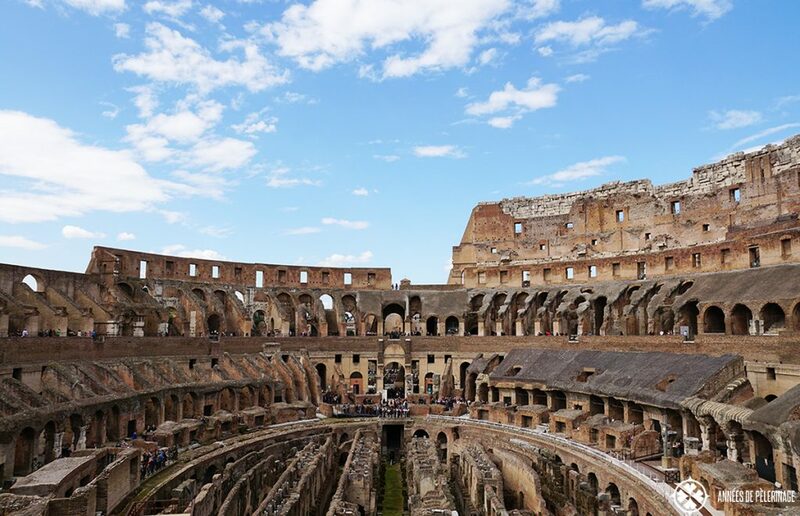 Tickets for Colosseum will get you in for free, as well as the Palatine Hill. This is where the Roman Emperors built their sprawling palaces, and this is where Romulus (the cities founder) built his first hut. Only a couple of meters away from the Roman Forums you will find a couple of other forums as well. Notably are Hadrian’s and Trajan’s Forum. No ticket is needed, as you can simply walk by and enjoy the impressive remains. Very lovely at night! Rome is a city of many hills. So in the evening, it pays off to climb one of these to enjoy a beautiful sunset. The Garden of the Oranges (Giardino degli Aranci) is my favorite spot to do so. You’ll have a wonderful view over the inner city and the garden itself is quite charming as well. Bring yourself some drinks and street food, and you’ll experience the perfect moment. 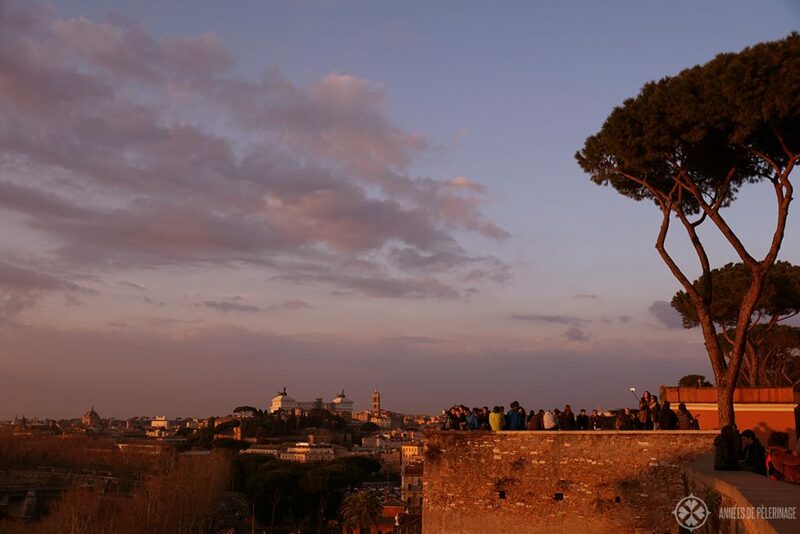 Alternatively, you can also climb the terrace above Piazza del Popolo, which is also a wonderful place to enjoy a sunset. In the portico of Santa Maria in Cosmedin, you will find a true curiosity. 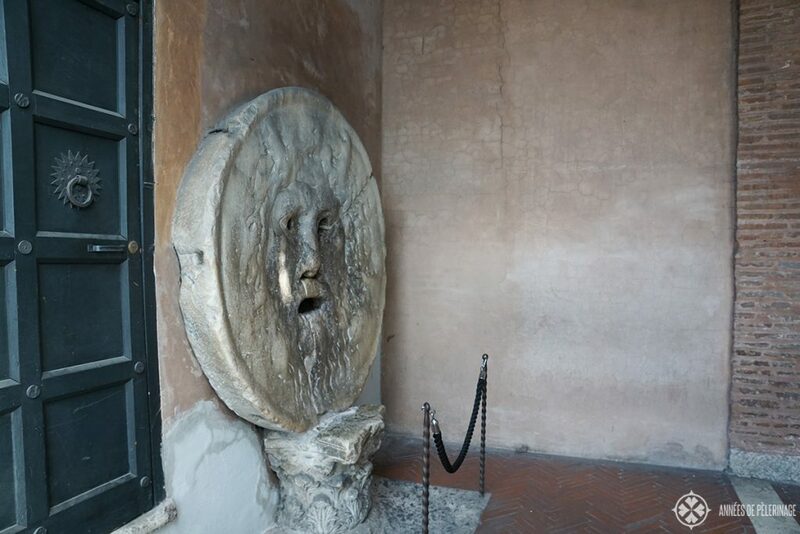 Roughly one meter in diameter, this marble disc is almost as old as Rome itself. Legend has it, that it will bite off the hand of those who tell a lie while putting their hands into its mouth. Frankly speaking, the only reason to go is seeing other tourists taking selfies with their hands in its mouth. 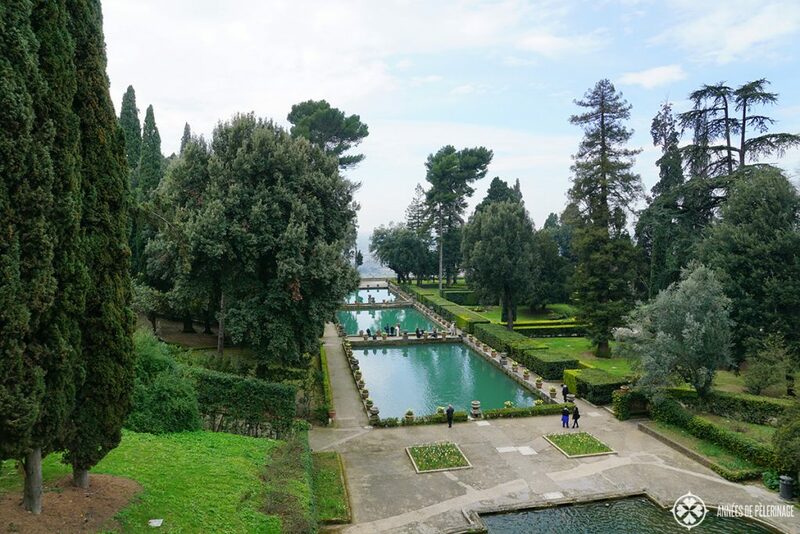 If you plan to visit the Giardino degli Aranci, you will walk right past it anyway. There sometimes is a queue in front of it. Have you seen the famous movie Ben Hur from 1959? Remember the famous horse race. Well, this took place in the Circus Maximus – the grandest horse race arena the ancient world ever saw. Up to 150,000 spectators were able to fit in. These days not a lot of its ancient glory remains. But is a wonderful public park and will still give you a true impression of its former size. There are many wonderful museums in Rome, but none will be able to top the Galleria Borghese. Here you will be able to see outstanding masterworks by Titian, Raphael, or Caravaggio. 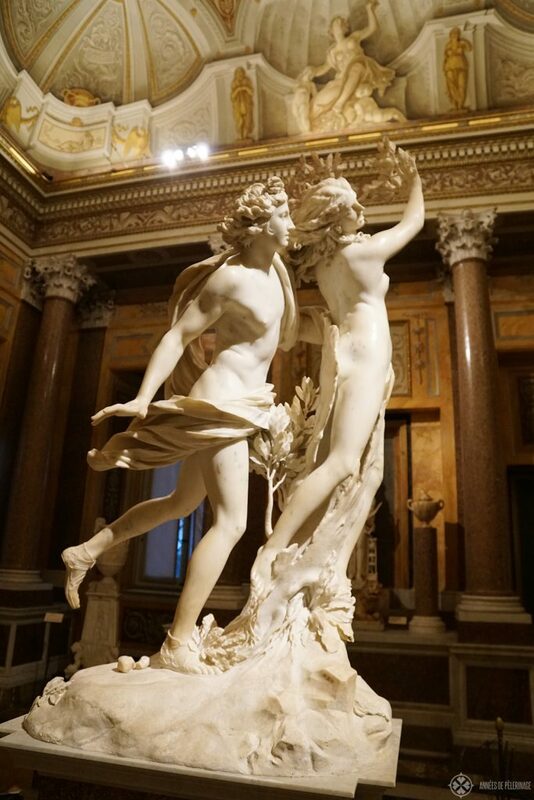 Most noteworthy are perhaps the otherworldly marble statues by Bernini. You absolutely need to reserve tickets way in advance – they are usually always sold out (here is the official link). I am not sure if someone ever counted all the churches in Rome. It remains an undisputed fact that you will not be able to see them all, no matter how long you stay. But, no matter how short your stay, you should definitely check out Santa Maria Maggiore. 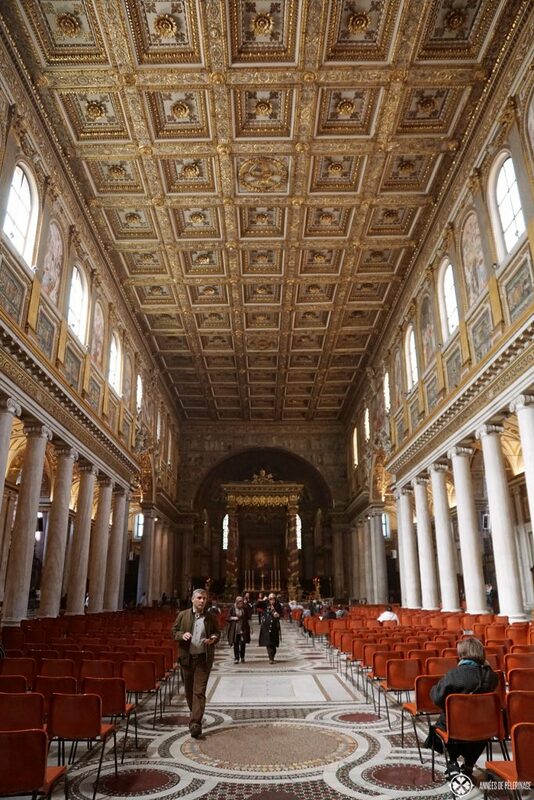 There are some amazing early Christian mosaics from the fifth century inside this papal basilica and an outstanding wooden ceiling. 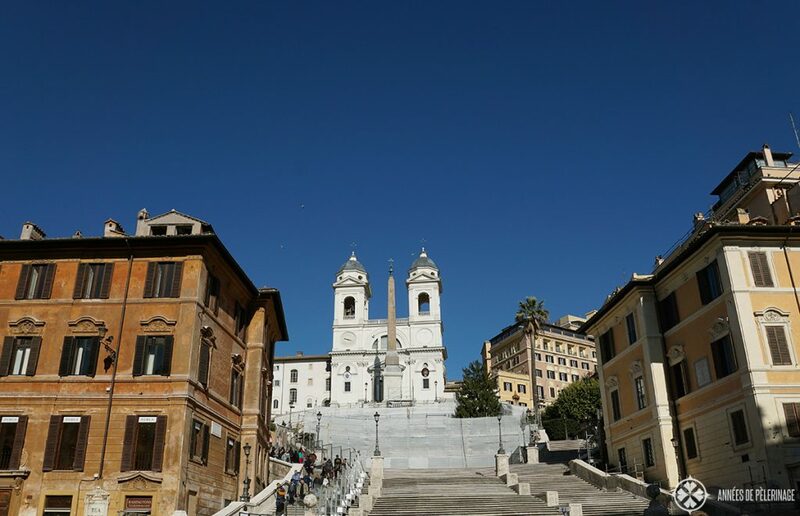 The Spanish Steps (Scalinate di Trinitá dei Monti) are one of the most famous perrons in the world. Usually crowded with tourists, it is currently being renovated (until August 2017 as far as I know). Especially in summer, when flowers are blossoming along its 135 steps, it should be right at the top of your list of things to do in Rome. 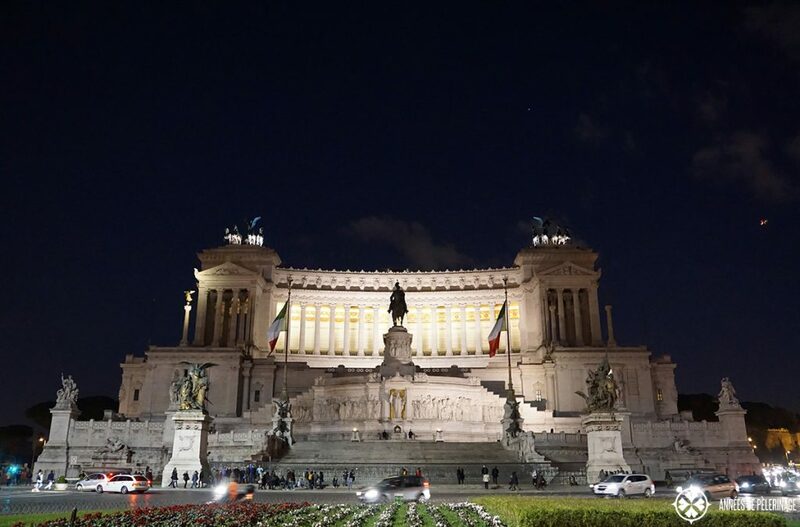 Rome is home to many piazzas. Actually, I am not sure if there are more churches or more piazzas in the eternal city. 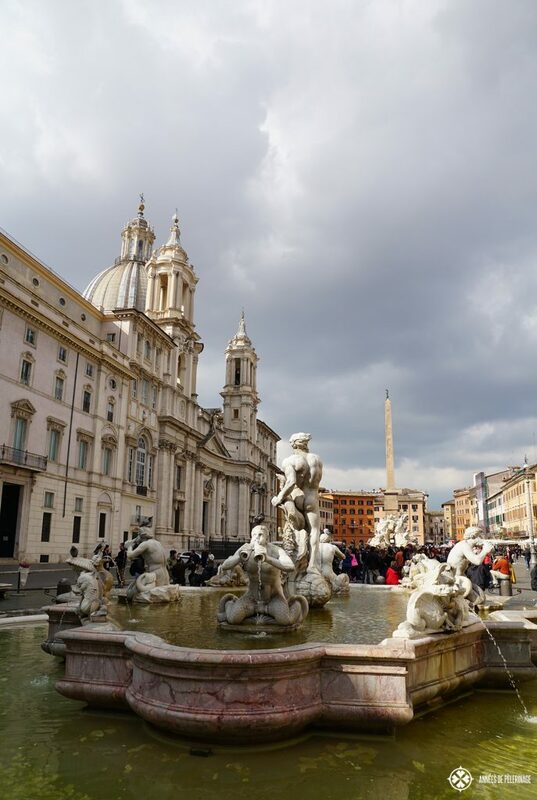 Piazza Navona and Piazza del Popolo are probably the most famous. After walking around the city the whole day, I do recommend to sit down and sip some strong Italian coffee. Watch people passing by and enjoy that bella vita! 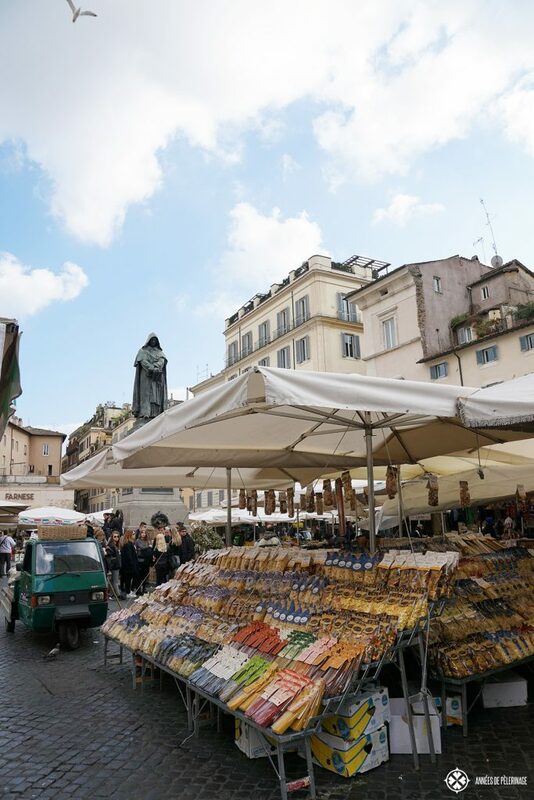 And talking about piazzas: Are you looking for some authentic roman food market? Then absolutely go visit the Campo de’ Fioro. It might be a tack touristy, but hey…in a city with so many millions of tourists each year, this is to be expected. Sample some cheese and some fresh fruits, or just look at the many stalls. There is a lovely bakery shop just around the corner that sells authentic pastries with like 200 different stuffings and toppings. It’s my personal favorite in Rome! 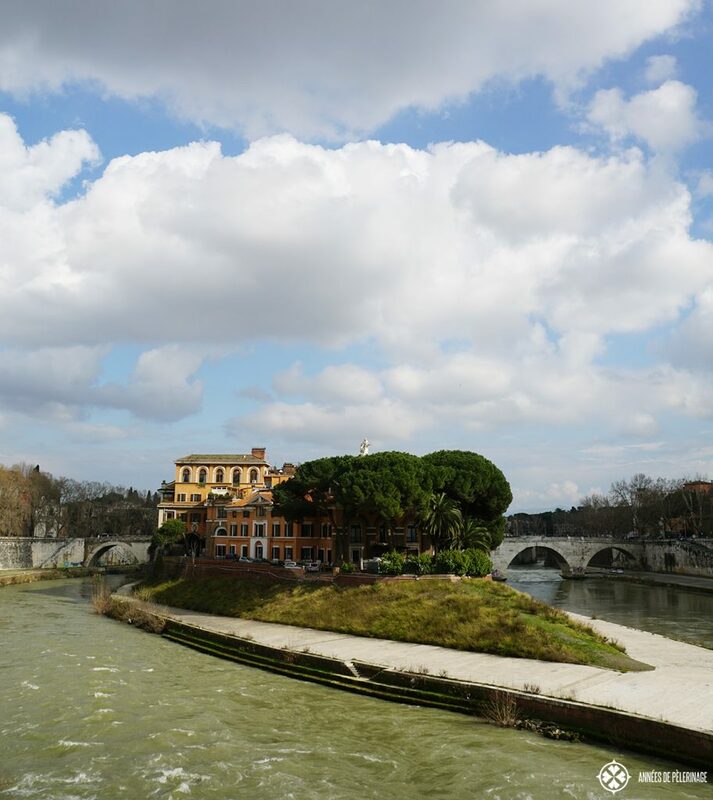 The Tiber is the unmissable river meandering through Rome. Personally, I love strolling along its tranquil banks. Early in the morning, the light is almost magical. It is also one of the quietest places in the whole city. Don’t ask me why, but other than a few joggers few tourists ever make it down below to the banks. For me, vacations are not a time to relax, but rather a time to explore! So don’t go to bed early each day, but rather plan to spend some quality time at night. Go to a bar or walk home from one of the many amazing restaurants. 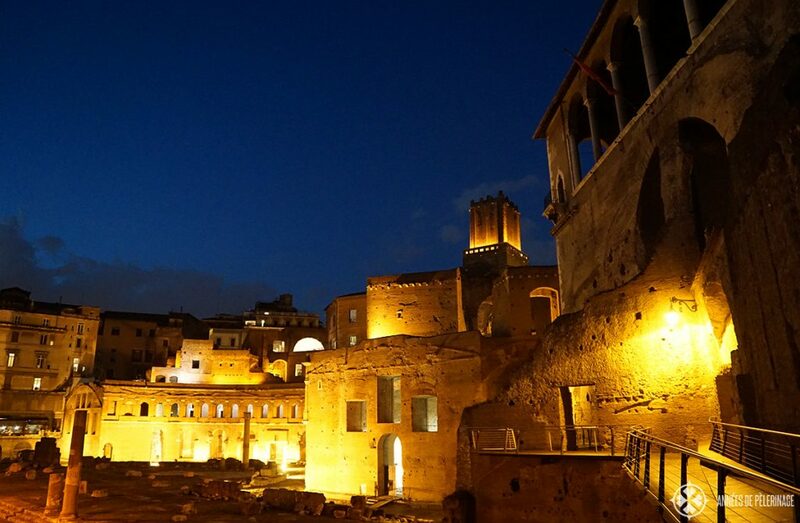 The Roman streets, the many piazzas, and ancient ruins will appear, quite literally, in a new light. Usually, there are hardly any tourists around either – just the locals having fun. Lovely as Rome is, it pays off to invest some time into getting out of the city. While there are many worthy destinations, I recommend you to check out Tivoli. Why? Because two outstanding UNESCO World Heritage Sites are located in the small town! The Villa Adriana, once home to Emperor Hadrian, is probably the most amazing imperial ruin in Italy, if not the world. I wrote about it here. The Villa d’Este is another precious gems. Thousands of gurgling fountains and a stunning park will make you want to stay forever. On an important site note: This is the place that originally inspired this blog! The most impressive remains of ancient Rome are probably its aqueducts. Hundreds of kilometers of those waterways once supplied the city with fresh water from the mountains. Not many of these aqueducts remain today. 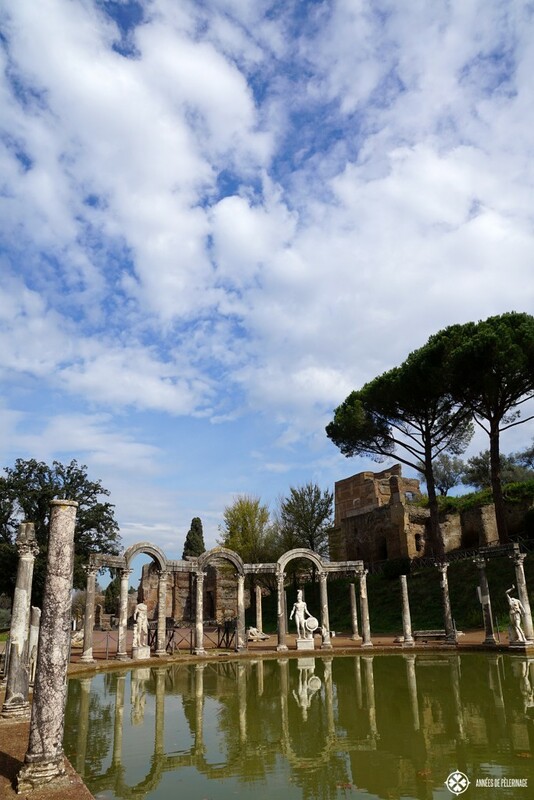 The best place to see them (especially famous Aqua Claudia) is the Parco degli Acquedotti. It is located some 8 kilometers outside of the city, but easily accessible through the Giulio Agricola metro station. 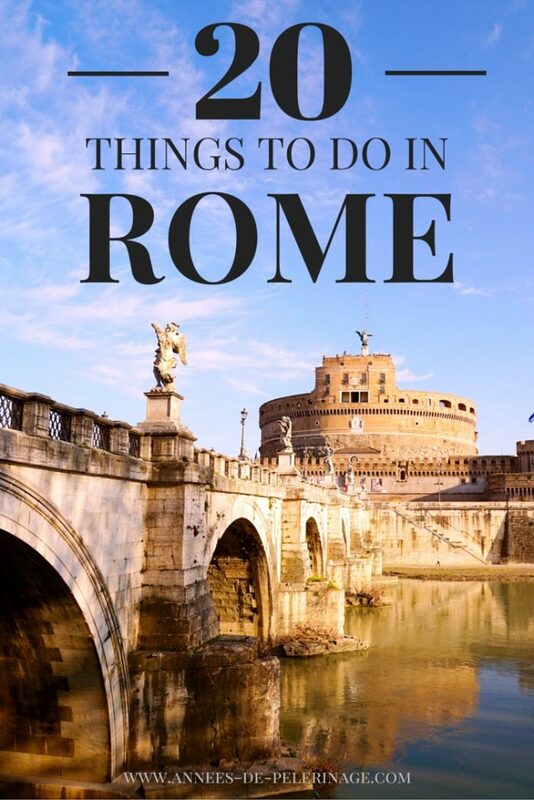 My last item on my list of 20 things to do in Rome is the most obvious. 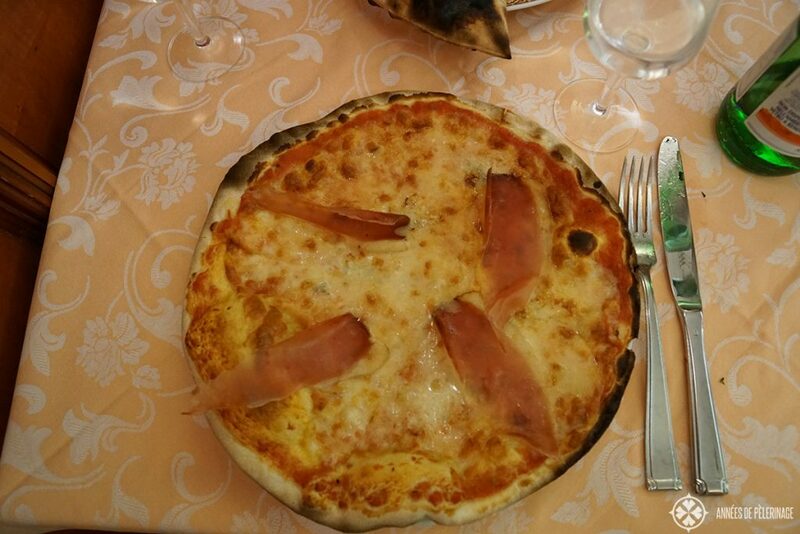 There is no way around sampling roman pizza and pasta. But don’t focus on these two timeless classics, and try out the many antipasti variations. To be quite fair, the Romans love their meats and fish. They also seem to devour artichokes in any state. And you absolutely shouldn’t forget the many, many dolci. And with dolci, I actually don’t mean buying an ice cream at the most tourist looking Gelato booth in the vicinity of the Trevi Fountain (hint, hint). 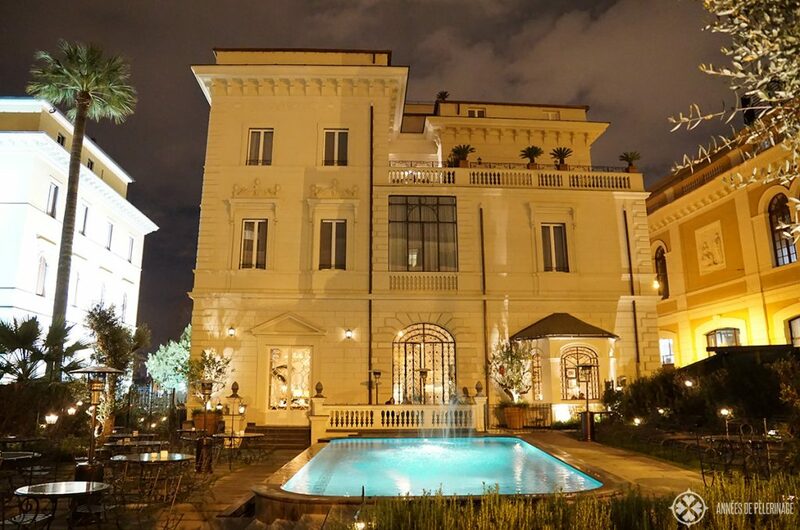 Finding a good hotel in Rome is far from easy. In fact, it sometimes feels impossible. While Berlin, London, Paris are home to every luxury hotel chain this world has to offer, most of them stayed away from the eternal city. Don’t ask me why, though. 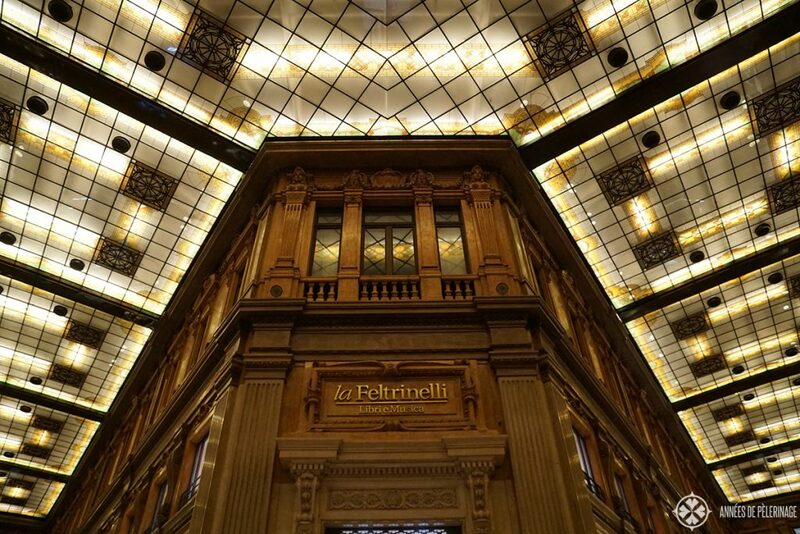 Last year I stumbled across the amazing Palazzo Dama (read my review here). A small luxury hotel located inside an old Italian Palazzo. Beautifully renovated and now home to the finest interior design ever. It is a true gem with only 20 bedrooms or so and right in walking distance to some of the biggest highlights. (Click here to check out priced & more pictures). 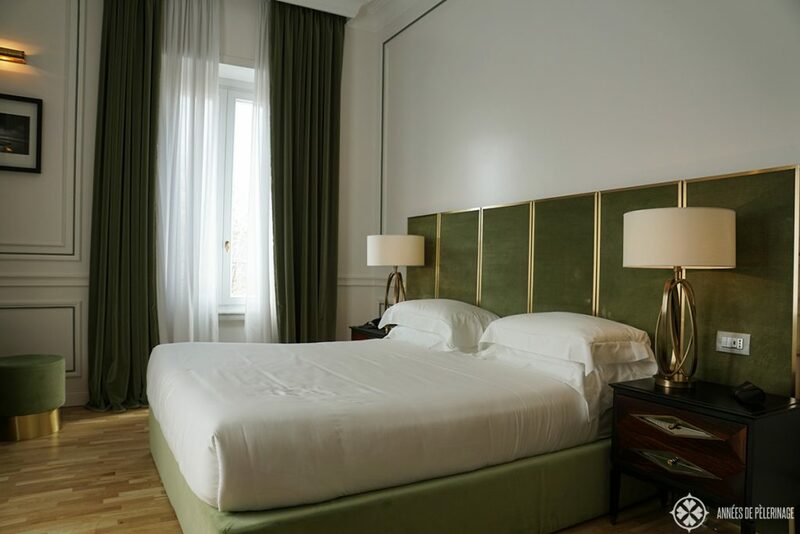 I can also recommend the Hassler Roma (very close to the Spanish steps) and the Rocco Forte Hotel de Russie, though the latter is a tiny tack too pricey in my opinion. There is also a Waldorf Astoria with a Michel Star restaurant located on the outskirts. But it has that beautiful pool, which might be a true life saver in summer. All in all, I wouldn’t get a hotel too far from the center of Rome. The Roman metro system has only two lines and barely covers half of the city. The bus system is close to incomprehensible for foreigners, and taxis are not especially cheap. I found walking to be the most convenient method to get anywhere. Again I really want to stress that I did not mention each and every highlight Rome has to offer. I also did not lose a single word on where to eat. Most Romans are very friendly, so do ask them for a recommendation. Hint: Most good restaurants look rather basic from outside & inside. Either way, if you got any questions or got any further recommendations: Don’t be shy and tell me in the comments below. Also, if you liked this guide, why not share it on social media! So cool! Rome is one of my favorite cities in Europe. 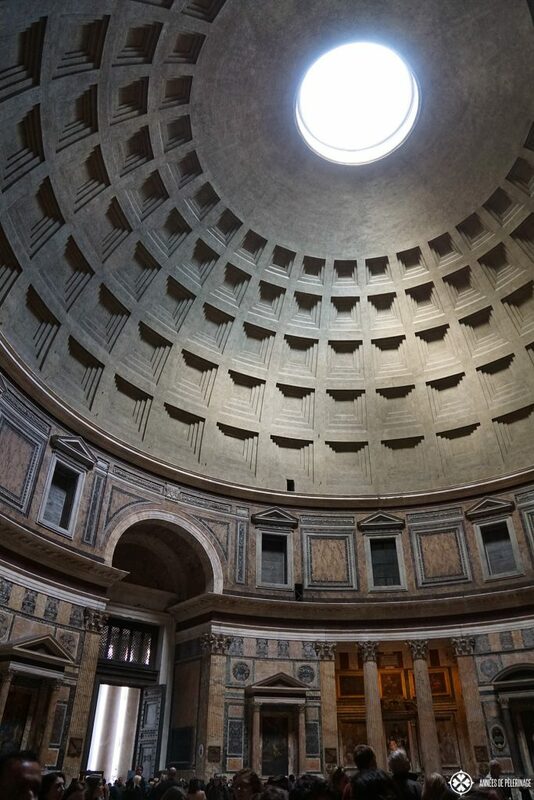 The Colosseum is truly amazing..but my favorite buildings is the Pantheon. Thx for sharing all these beautiful pictures. I wanted to travel ever since I was born. I am from a small Island now living in Florida and seeing you wonderful pictures of Rome just renewed my interest. I have seen a few places but Rome is a must. Thanks for sharing. 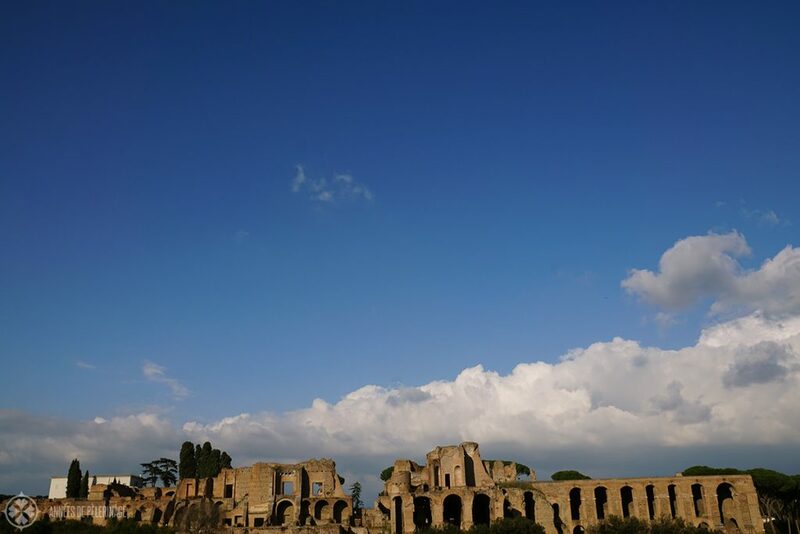 One of my best tips with seeing the colosseum, palatine hill, and forum is to go to the palatine hill first. I’ve shown up 10 minutes or so before it opens and have been the second group in line. 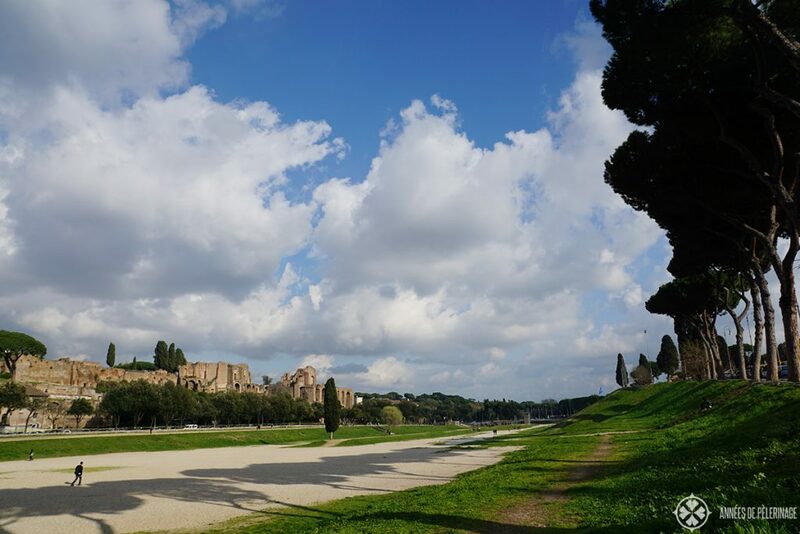 From there, you can explore the palatine hill and the forum, and when you’re done, you can walk by the huge line for the colosseum. There’s still a line during peak travel season, but it’s significantly shorter. 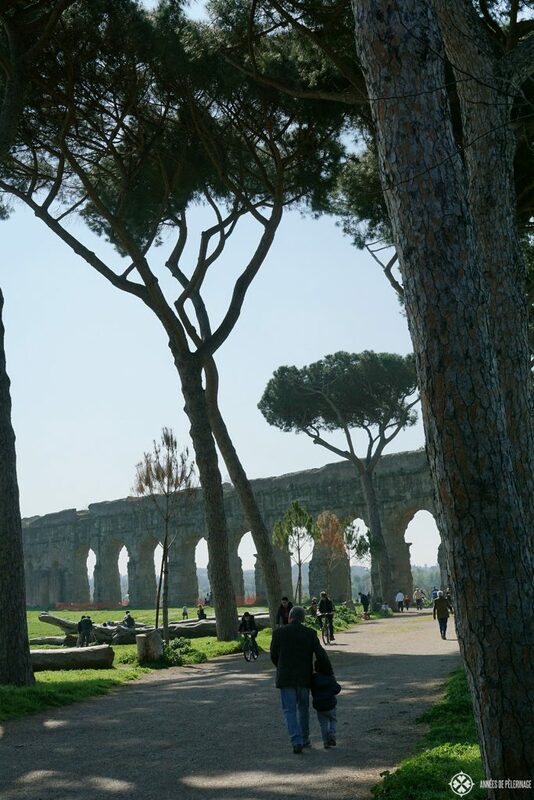 A pleasant Sunday can also be found on Via Appia Antica. Cars are not allowed on the road on Sundays, if memory serves (I happened to be on it after a race, so it was still closed to cars). There are several monuments, churches, and ruins along the road, including catacombs that you can go in. I walked part of it, but you could also rent a bike. My favorite restaurant is Osteria der Belli in Trastevere. Amazing food, great atmosphere. Some restaurants are becoming more “Americanized” with huge portions. Osteria der Belli keeps them small (the way Italian food is supposed to be), so that you can order different courses and split amongst friends. And I agree, finding a good osteria is getting harder and harder. Some good ones are actually mentioned in the michelin guide. Wonderful pictures and good suggestions for a first timer. However, please make one correction. When discussing the Circus Maximus, please note that the famous chariot race was in Ben Hur, NOT Spartacus! Also is the garden of the oranges on top of the Aventine? 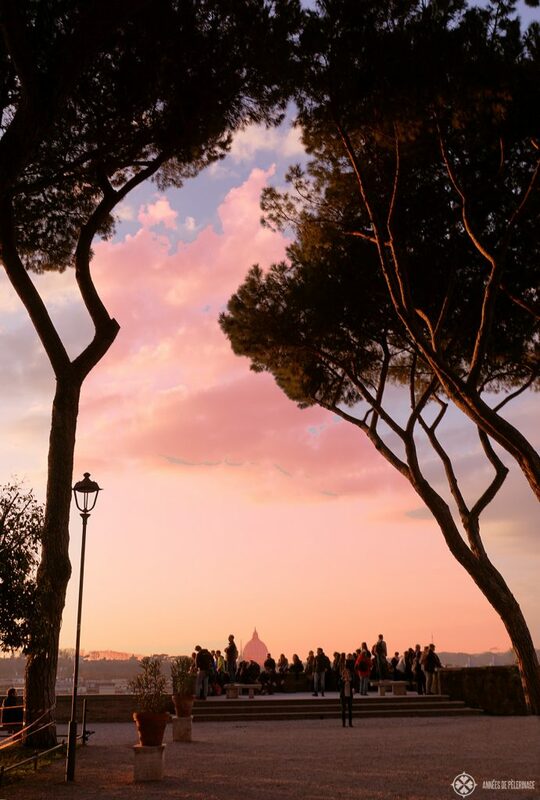 You could also suggest the top of the Janiculum for a great view. thank you for finding that mistake. Of course, it is Ben Hur! I corrected it at once. Oh I just adored reading this. I was 16 when I first visited Rome on a school trip (I’m now 51!). I fell in love with the city straight away. We didn’t get to do everything but what we did was bliss. We went on a tour of some catacombs and it was something else. It really brought to life how early Christians were persecuted. The Colesium is amazing and when I closed my eyes I could almost hear the crowds and the ringing as weapons struck each other. One thing we did which I would highly recommend is a trip to see Pompeii and Vesuvius. We did have to leave very early in the morning but it was simply unmissable. Everyone knows about Italians and how they drive, we’ll believe me being on an Italian coach driving up and down to the crater of the Volcano was an experience in itself but as Italy is my favourite country in the world it encapsulates all the quirky Italian things that make me love it so much. Right off to read more of your blog. Great work! funny you should mention it, but I was 16 on my first trip to Rome as well. Geee…that’s quite a long while ago! We got to see the newly opened & restored Domus Aureus and I was sooo excited, cuz obviously I was reading the latin classics at that time in school and wanted to see how Nero lived. Anyhow, yeah Pompeii is amazing. I did not mention it here, because it’s quite far away from Rome. Doable on a day trip, but as Rome has so many other highlights in the vicinity I skipped it. 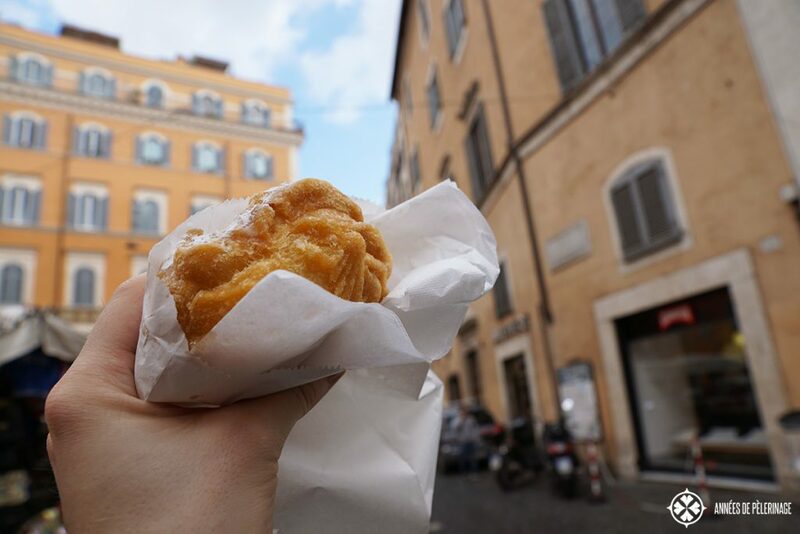 But it really shouldn’t miss in a full-fledged Italy itinerary! Thank you for the concise yet comprehensive guide. 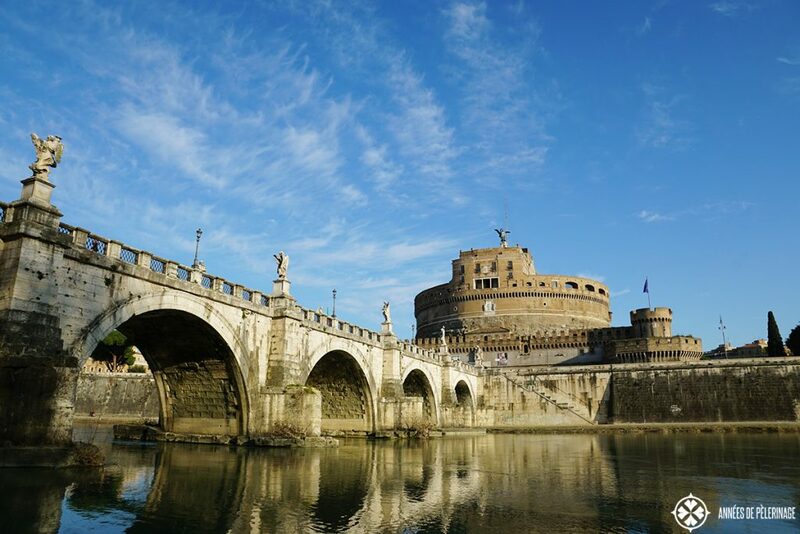 My family will be visiting Rome next month with our children(ages 9 & 10) and the opportunities are endless so I truly appreciate your article. that sounds like quite the holiday. I’m sure you’ll love it. I fondly remember visiting Rome with my parents for the first time as well. Had latin at school, and suddenly it all came alive!